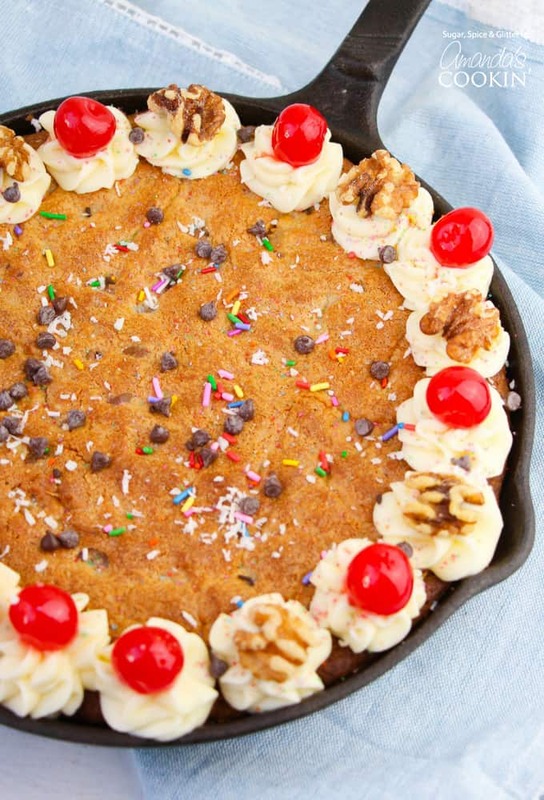 Chocolate Chip Cookie Skillet: great for birthdays or parties! 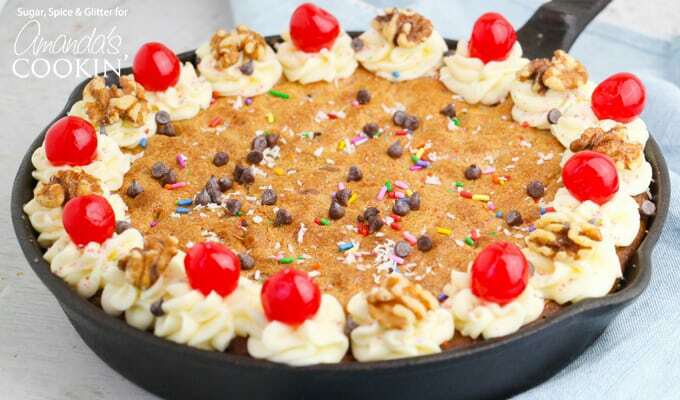 One of our favorite dessert to bring someone on their birthday is this Chocolate Chip Cookie Skillet. It looks like a cake, especially if you decorate it like we did. The best part? When you cut into it, you reveal a giant, fluffy chocolate chip cookie. Marry your skillet with your favorite cookie recipe, or follow the recipe below to make an everything-but-the-kitchen-sink cookie! We have some weird family members who don’t like cake. I know. Who doesn’t like cake?! 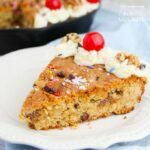 But this giant chocolate chip cookie skillet presents the perfect solution for a pretty and easy dessert – and the difference between making this cookie in a cast iron skillet instead of a circular cookie pan is that it ensures a deep-dish cookie with a tender, fluffy inside. For the cookie, you can use your favorite cookie recipe – our brown butter chocolate chip cookie or caramel-stuffed double chocolate cookies would be delicious, but for this cookie, we wanted an “everything but the kitchen sink approach” so we decided to go with our version of the famous Hilton Doubletree cookies, with shredded coconut, oats, walnuts, chocolate chips and a secret ingredient! This recipe makes enough for one 1 skillet cookie plus approximately 8 single-serving size cookies which are great when you’re baking with kids. They can enjoy the “bonus cookies” and not be tempted to cut into the giant skillet cookie before you have a chance to gift it. Do you have someone crazy in your life that doesn’t like cake? Make this Chocolate Chip Cookie Skillet for them! Put your skillet to good use! Try these delicious skillet recipes below! 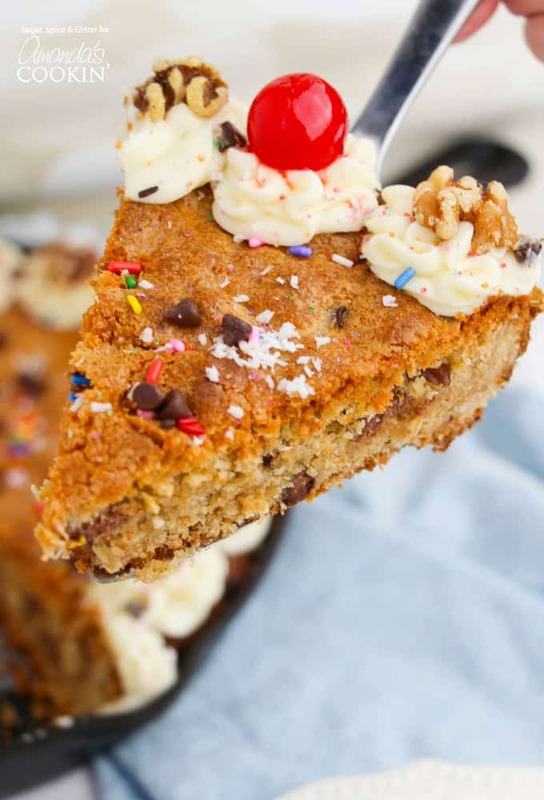 This Chocolate Chip Cookie Skillet can pass as a birthday day if decorated! When cut into, you reveal a giant, fluffy chocolate chip cookie! Grease a non-stick cast iron skillet and set aside. Combine the oats, flour, baking powder, salt and cinnamon in a small bowl and set aside. In a large bowl, combine butter and sugars until fluffy - about 2 minutes. Add in the eggs and vanilla, mix well, then add in the lemon juice. Add the flour mixture in one cup increments until fully combined. Place the skillet in the oven and bake for 25-30 minutes, until golden brown on top and fully cooked in the center. Watch carefully so it doesn't burn. Garnish as desired - we used a closed star tip on a piping bag filled with vanilla buttercream to make small dollops around the edge, added cherries, walnuts, and sprinkles and extra chocolate chips and shredded coconut for a fun birthday finish. Yuuuuup. This. Is. Bliss. Pure bliss. I mean come on, who could pass up a big giant WARM chocolate chip cookie! ?